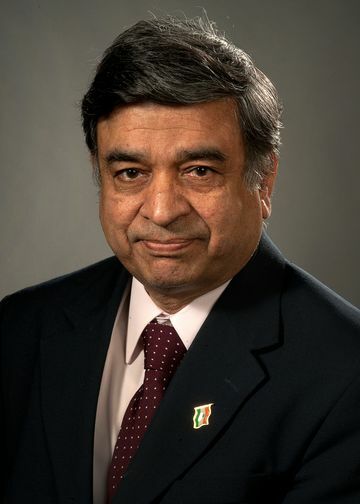 Dr. Pravin C. Singhal is director of the renal molecular research laboratory and academic affairs in the division of kidney diseases and hypertension at Northwell Health. He was appointed as chief of nephrology at Long Island Jewish Medical Center in 1994 and became chief of unified divisions of kidney diseases of North Shore University Hospital and Long Island Jewish Medical Center in 1999. He also has been president of New York Society of Nephrology. He has more than 250 publications to his credit and has been an NIH investigator for the last 25 years. Dr. Singhal’s main focus of the present research is to study the involved mechanism of the progression of renal lesions in patients with HIV-associated nephropathy. HIV-associated nephropathy (HIVAN) is an important complication of acquired immunodeficiency syndrome (AIDS). Its manifestation requires presence of specific ancestry (APOL1 gene), environmental (HIV infection) and host factors. Although significant research has been done to identify and to delineate the involved genes to correlate with the ancestry, there has been a limited effort to identify subversive activities of HIV, which might be contributing to specific host factors required for the display of unique phenotype of renal lesions in HIVAN. Dr. Singhal hypothesizes that altered renal cell (RC) gene expression as a consequence of HIV-induced altered epigenetic chromatin modifications (through DNA methylation) may be contributing as specific host factors for the manifestation of kidney cell phenotypes displayed in HIVAN- collapsing variant of focal segmental glomerulosclerosis and microcystic dilatation of tubules. In preliminary studies, he found the HIV enhanced renal cell expression of Snail (a repressor of E-cadherin transcriptor, and a promoter of proliferative phenotype). Since Snail, a gene regulator, has also been demonstrated to repress transcription of vitamin D receptor (VDR) and nephrin (a podocyte slit diaphragm protein), it carries a potential to alter podocyte phenotype. In our laboratory, he demonstrated that both glomerular and tubular epithelial cells in HIVAN mice displayed enhanced expression of Snail and diminished expression of VDR. On the basis of these findings, he hypothesized that HIV-1 induced epigenetic factors (DNA methylation) may be contributing to the development of HIVAN phenotype through up regulation of Snail and down regulation of VDR and nephrin. Emerging data suggest that the majority of people of African-American descent are vitamin D (VD) deficient. VD works through cross-linking with its receptor, the VDR, and prevents its degradation. Therefore, patients with low serum VD levels are likely to be associated with compromised renal cell VDR expression. Currently, he is testing these hypotheses in his laboratory. If epigenetic factors are contributing to the development of HIVAN, we will develop therapeutic strategies to neutralize them. Recently, in vivo studies have suggested that tubular cells may be serving as a reservoir for HIV-1. He is studying whether HIV-1 can infect tubular cells in vitro and may also serve as a potential reservoir. The mechanism by which HIV-1 enters these cells has not been identified. We observed that the C type lectin DEC-205 acts as a HIV-1 receptor in human kidney tubular (HK2) cells. Interaction of HIV-1 with DEC-205 results in internalization of the virus and establishment of a nonproductive infection. HIV-1-specific strong stop DNA is detected in the infected HK2 cells during the follow up period, and the virus can be rescued by co-cultivation with sensitive target cells. HIV-1 entry is blocked by pre-treatment with anti-DEC-205 specific antibody. Moreover, expression of DEC-205 in cells lacking the DEC-205 receptors renders them susceptible to HIV-1 infection. These findings suggest that DEC-205 acts as a HIV-1 receptor mediating internalization of the virus into renal tubular cells, from which the virus can be rescued and disseminated by encountering cells. Dr. Singhal intends to study the involved mechanism in interaction between DEC-205 and HIV-1. In addition, he is also evaluating the effects of opiates and ethanol on T cell injury. T cell is an important immune cells. Opiate addicts and alcoholics are prone to infection. They also have low T cell count. Understanding the involved mechanism of low count in these populations will help him to develop therapeutic strategies to prevent it.